I am reposting this from several years ago because for me it is one of the most important stories to reflect on as we enter Holy Week. I return to it every year and grapple with how well my life reflect this subversive Jesus and not the domesticated Jesus we so often want to live with. It’s Holy week and Jesus journey towards the cross has begun. Tomorrow we will process around the church on Palm Sunday, and buy our Easter eggs and hot crossed buns, diverting our attention from the real meaning of Easter to its commercialized version. How many of us are sucked in? We Have Entered the Most Subversive Week of Jesus Life. What is the focus of your thoughts as we head through Holy week – is it on the life, death and resurrection of Christ or is it on the upcoming Easter egg hunt and whether it will be warm enough to wear your new spring outfit? 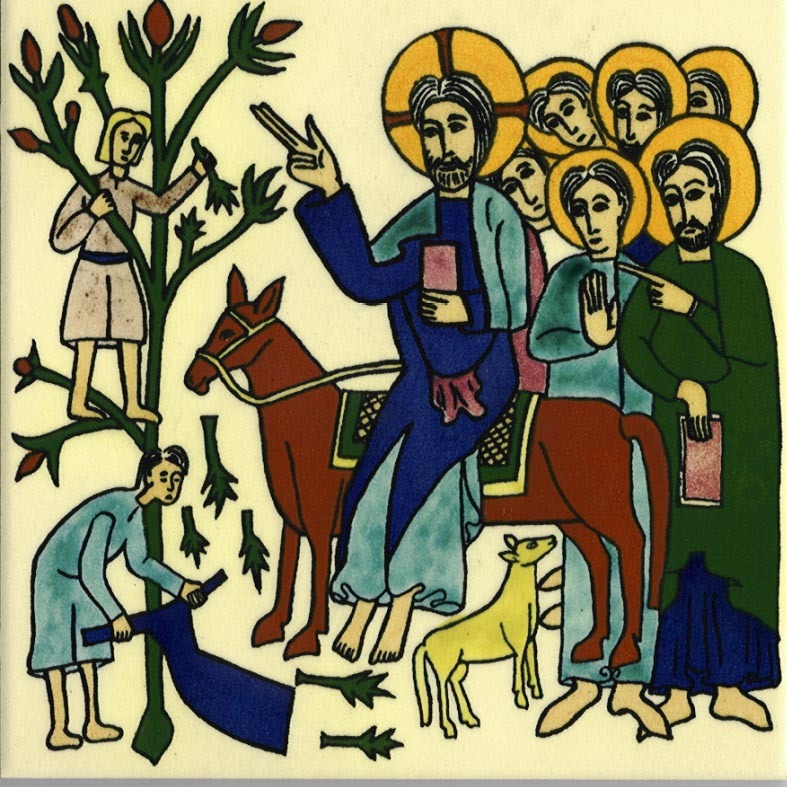 Most of us know that Palm Sunday commemorates Jesus triumphant procession into Jerusalem on donkey’s back but few of us are aware of the deeper and very subversive implications of this event. And as we walk through holy week towards the cross Jesus actions become more and more subversive. We have in fact entered the most subversive week of Jesus life. According to Borg and Crossan’s important book The Last Week (2006), it is probable that there were two processions going on into Jerusalem on Palm Sunday – one that symbolized the Roman culture of Jesus day and the other Jesus proclaiming his upside down kingdom. It would have been customary for Pontius Pilate the Roman governor assigned to Judea and Jerusalem to come with his soldiers to Jerusalem for Passover. His procession would have come from the west at the head of a column of imperial cavalry and soldiers – an impressive and lavish procession specially designed to impress the people to discourage potential uprisings with a visual display of imperial power: cavalry on horses, foot soldiers, leather armor, helmets, weapons, banners, golden eagles mounted on poles, sun glinting on metal and gold. On the other side of the city, down from the Mount of Olives in the north came Jesus and his humble procession – no pomp, no ceremony, dressed simply like the people, riding on the back of a donkey and followed by his disciples drawn from amongst the peasants and the common people. I imagine the lepers he had healed and the once blind man dancing and rejoicing with him. And there is Lazarus with Mary and Martha a living symbol of the triumph that this procession represents. Here was the truly triumphant procession and the true rejoicing of the season. 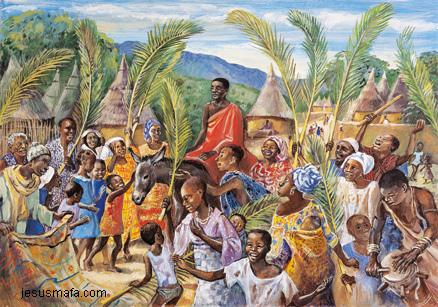 Shouts of “Hosanna! Blessed is the one who comes in the name of the Lord! greeted their passing. But this was a radical procession that really thumbed its nose at the Roman Empire with its power and wealth. Then Jesus headed to the temple, overturned the tables and threw out the moneylenders proclaiming loud and clear to the religious leaders that their alignment with the power of Rom was totally unacceptable to God. And he caps the week off with a Passover meal, not revealing himself as an emperor messiah his followers and even his disciples were hoping, but washing feet, indelibly imprinting on his disciples this final image of a slave, the last loving act of an upside down king. This week brought the savage conflict between the kingdom of God and the empire of Rome to a head. Not just a theological statement but a political one as well. Jesus’ belief in the liberating, inclusive, non-violent, peace-seeking kingdom of God was over against the oppressive, greedy, elite-loving, peasant-starving kingdom of Rome. No wonder his was so angry with the Temple hierarchy – the chief priest, the elders and the scribes – who had become servants of the empire and not of the God’s kingdom. Jesus’ ride into Jerusalem was obviously headed for a collision with the powerful Roman empire – a collision that would cost his life and change history forever. Jesus triumphal entry into Jerusalem may have begun with crowds shouting Hosanna but it ends with Good Friday and the apparent triumph of the powers of the Roman Empire and of Satan. It does not end with a gold crown but with a crown of thorns. Jesus triumphal entry ends with his willingness to take into himself all the pain and suffering of our world so that together we can celebrate the beginning of a new procession on Easter Sunday – a procession that leads us into God’s banquet feast and the wonder of God’s eternal world. Which Procession are you a part of? 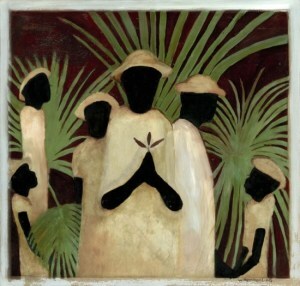 The question for all of us as we walk with Jesus from Palm Sunday to Good Friday is: Where is our allegiance? Are we part of that ragamuffin discipleship band following Jesus fully aware that we are on a collision course with the values of our secular culture? Do we only want to follow Jesus when we think he promises wealth, power and happiness. Have we so misunderstood him and his purpose that we are ready to turn against him when he turns out not to be who we thought he was? Perhaps, we’re not part of Jesus’ procession at all. Perhaps we’re standing at the other gate, cheering for the symbols of empire, enthusiastically, supporting our own idea of a messiah, that looks more like the Roman emperor than the humble servant Jesus. Dazzled by power, attracted to wealth, wanting to identify with the victors, not the vanquished, hoping to be counted as one of the elites of our time. 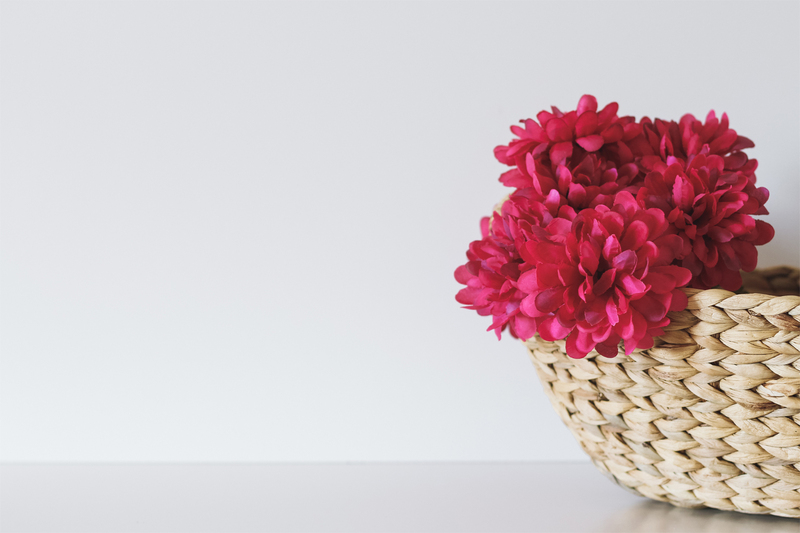 Actually most of us are probably part of both processions – wanting to follow this Jesus whom we find so attractive yet whom we don’t fully understand but also caught up in the excitement of Easter egg hunts and spring fashion displays. The beauty is that Jesus, in his humanity, sees and knows all of us. . . the flawed humanity that surrounds him. . . the flawed humanity of each of us. . . and he sees it and he forgives it, and loves us, and gives his blessing to all of us as he clops along the dusty road toward his confrontation with power, his time of trial, his abandonment, his death.